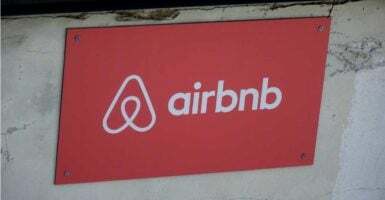 Pennsylvania has shut down a small-business owner for helping others post on Airbnb, the website for renting short-term guest rooms in private residences. Sally Ladd filed suit against the state after receiving notification that she would need a real estate license to continue helping others manage Pocono Mountains properties online. The licensing necessary requires more than 300 hours of training, a physical office location, and three years of working under a broker, according to the Institute for Justice, a nonprofit legal foundation. Ladd began managing short-term rental properties for others on Airbnb in 2013, and had managed her own since 2009, Windham told The Daily Signal. Pennsylvania’s Bureau of Professional and Occupational Affairs called Ladd earlier this year to say she was under investigation because a complaint had been filed. The bureau decided she would need a broker’s license to continue. “The license requirements are really burdensome. Sally is just helping post their properties for rent on sites like Airbnb. Residential real estate brokers buy and sell houses worth hundreds of thousands of dollars,” Windham said. “You shouldn’t need to open an office, pass two exams, and work as an apprentice for three years just to help someone rent a vacation property on Airbnb,” he said. The state bureau declined to comment on the issue or the lawsuit. Fortunately, the Pennsylvania Constitution protects Sally’s basic right to earn an honest living, free from arbitrary and protectionist legislation. Laws restricting that right must bear a ‘real and substantial’ relationship to a legitimate government end, and may not impose an ‘undue burden’ on the freedom to pursue a chosen occupation. Paul Larkin, a senior legal research fellow at The Heritage Foundation, agrees that the licensing statute is an undue restraint on Ladd’s entrepreneurship. “Pennsylvania law threatens Sally Ladd with civil and criminal penalties for doing what the free enterprise system, and every state’s law, should protect—namely, pursuing an entirely lawful business opportunity in a manner that harms no member of the public,” Larkin said.